The only place in the 4 corners that does iPhone repair & batteries right! Did you know we are the only store in the 4 Corners region that carries new Apple branded batteries? We’ve seen 3rd party batteries and the OEM pulls that many establishments use and you definitely don’t want those batteries in your phone. They are unreliable and at times can be dangerous. At The Mac Ranch we receive our Apple batteries directly from Apple, guaranteeing a quality product that will get the job done. The Mac Ranch is an Authorized Warranty and Repair Center. 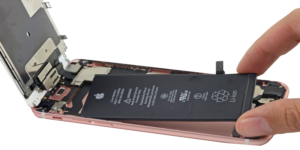 Our techs are trained by Apple guidelines for any iPhone repair and battery replacement and are permitted to work on warranty and non-warranty Apple technology. All non-vintage Apple hardware is ordered directly through Apple, guaranteeing a quality product. Give us a call at (970) 259-1187 and we'll get your Apple product fixed up in no time! To get your iPhone fixed up in no time!